The Bishop’s Castle Railway Society was formed in 1989 in response to interest generated by an exhibition held by The Bishop’s Castle Local History Society. Members seek to obtain artefacts, document recollections and generally preserve the history of the Bishop’s Castle Railway. 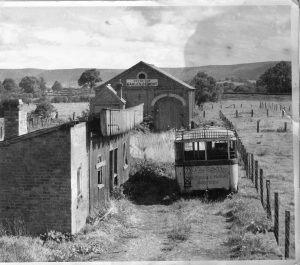 In 1986 the Southwest Shropshire Historical and Archaeological Society arranged an exhibition about the Bishop’s Castle Railway. This generated a great amount of public interest. Also later that year the brick built goods shed at Bishop’s Castle was demolished as it was considered unsafe. This led to Ken, Paul and Keith Lucas meeting one Saturday evening to discuss preserving the history of the old line. Following the Lucas family get together, in early 1989 a public meeting was arranged to attempt the formation of a Bishop’s Castle Railway Society. This resulted in a well-attended meeting and the birth of the Society in 1989, shortly afterwards becoming a registered charity. c) to gather together the remaining exhibits for display in a museum in Bishop’s Castle.